Do you love working with people and animals? Are you passionate about wildlife conservation? Become a Potter Park Zoo Docent and join over a hundred others with the same appreciation for wildlife and desire to make a difference. 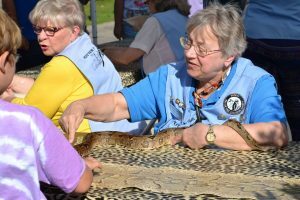 Zoo docents are the friendly, fun-loving and knowledgeable volunteer men and women who conduct the various educational programs at the zoo and in the community. As a docent, you’ll receive a discount in the AniMall Gift Shop and a free family membership to the Potter Park Zoo after one year of service. But the main benefit is being able to participate in one of the best wildlife education programs in the country by helping people of all ages learn and understand the importance of preserving our wildlife environment. Interested? Click on the link below and fill out an application. Applications for the 2018 class are due January 31. Docent classes will be held February-early April. 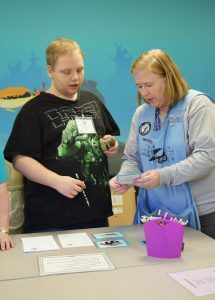 Please check out our What’s Happening for other great ways to get involved at Potter Park Zoo.